(BURNSIDE TOWNSHIP) – Two men remain hospitalized following a crash Wednesday during whiteout conditions. Rescue crews were called to Van Dyke Road north of North Branch Road in Burnside Township shortly before 1:30 p.m. Wednesday, according to the Lapeer County Sheriff Department. Investigators said 30-year-old Kevin Warnick of Lapeer was northbound on Van Dyke in a 1995 Chevrolet Silverado pickup. 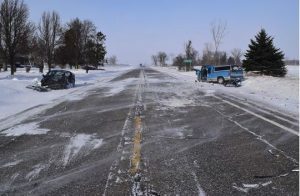 There was a significant west wind causing snow from an open farm field to blow across the roadway, according to the sheriff department. Witnesses reported to deputies almost whiteout conditions occurring. Warnick crossed the centerline and into the path of a southbound 2013 Hyundai Elantra driven by 28-year-old Zachary Lanctot of Carsonville. Both vehicles departed to opposite shoulder following the head-on collision. Neither vehicle was carrying passengers. Brown City Fire Department responded and extricated both drivers. Lapeer County EMS transported both men to McLaren in Lapeer. Preliminary investigation suggest that neither speed nor alcohol were contributing factors in this traffic collision, according to the sheriff department. Blowing snow creating whiteout conditions and low visibility are considered contributing factors, according to investigators. The roadway was closed for about three hours for rescue and investigative purposes. The Lapeer County Sheriff’s Office was assisted at the scene by Brown City Fire Department, Michigan State Police, Yakes Towing and Lapeer County Road Commission. Warnick is in serious but stable condition. Lanctot remains in critical condition with life threatening injuries, according to the sheriff department.